The appeal of a fat bike is undeniable: the instant you see one, you just gotta ride it! 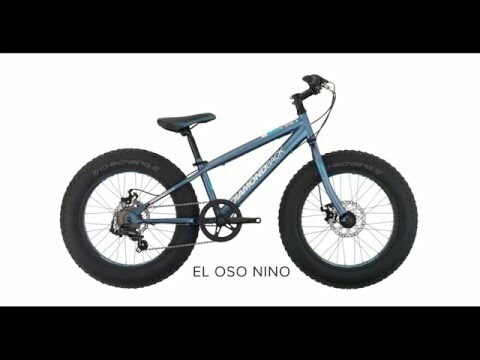 El Oso Nino is our smallest fat bike, made for kids who want to monster truck over everything in their path. This little bear's frame and fork are made from hi-tensile steel, tough enough for life in the neighborhood and the woods. It's got a seven-speed Shimano grip shifter to charge up hills, and powerful disc brakes for controlled descents and stopping. But the focal point of the bike is definitely its wheels and tires and yes, they really are as cool as they look! Four-inch-wide tires sit atop 20" wheels, making for a unique style and ride. Low tire pressure allows the bike to grab every bit of traction available, with extra float for soft surfaces and sand. It's very possible El Oso Nino would work on the Moon what do you think? Boys/20" / Rider Height: Age 6-10 45" - 56"
My son loves his new fat bike! Excellent quality.